The new Wemo bridge supports Apple's HomeKit, meaning that all of your Wemo smart accessories can be added to preset Home app scenes. Belkin currently has a wide variety of smart devices, ranging from smart plugs and dimmers, to lightbulbs and security cameras. These devices can all easily be controlled through the Wemo app, but with the new Wemo Bridge, they dont have to be. The Bridge hooks up to your Wi-Fi router and connects directly with HomeKit, meaning the Wemo app is not required for setup. Theres currently a lot of smart home devices on the market, but those that lack HomeKit support require you to download and use a specific app to control it. If you have smart accessories from five different manufacturers, you have to use five different apps to control them. The beauty of HomeKit is that you can control and set up as many supporting smart accessories as you want, all from the Home app. It gets even better than that, you can create scenes that can control all of your connected devices at the same time with a single command, either by pressing a button in the Home app or using Siri. This level of control would not be possible without HomeKit. When Apples HomePod sees released, it will act as your homes hub for all of your HomeKit devices while also acting as a Siri assistant and high-quality wireless speaker. Belkin's Wemo Bridge is available to order for $39.99 from Amazon. 2 Belkin smart plugs cost $40 at Costco (cheapest) + $40 bridge = $80. This may be only solution for existing owners who want to bring their Belkin smart plugs from Alexa to HomeKit. However, it would be better off to just dump those smart plugs and buy HomeKit compatible devices instead. Belkin is way too late for me. I’ve started replacing all my WeMo stuff with HomeKit compatible equivalents over a year ago. However, some of the Wemo things just stopped working and even a reset wouldn’t work. I needed to replace them anyway but I accelerated it to get HomeKit compatibility. It’s too bad, Belkin was early getting “smart” products out and I liked them 3 years ago. I have a few Wemo switches. I have had them for years. But since Home Kit is limited to newer hardware, I'm not sure this is an upgrade for me. None of my current smart devices are compatible. Also, "Theres currently a lot of smart home devices on the market, but those that lack HomeKit support require you to download and use a specific app to control it. If you have smart accessories from five different manufacturers, you have to use five different apps to control them." Is not a fair statement. Since Homekit compatibility is limited, its not a catch all app... yet. I use the Samsung Smatrthings app and it handles my hardware from 5 manufacturers. Did you read the article? 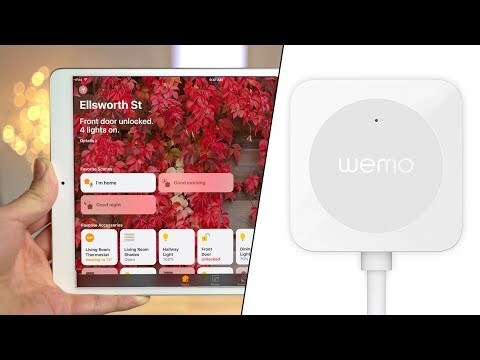 The Wemo bridge makes all your existing Wemo switches work with HomeKit. Belkin has been woefully slow in making this fix, but for those of us who haven’t been excited about the prospect of uninstalling and replacing hardwired Wemo light switches, it’s good to see this product finally coming to market. Sorry if I confused you. My Wemo devices can be upgraded, but everything else in my house can't be. I see no point in upgrading just my Wemo devices if they will be they only things I can control with Homekit. I will still need to upgrade the other 9 pieces of hardware in my house from 5 manufacturers. When that is done, then I can use homekit to control everything from the one app.